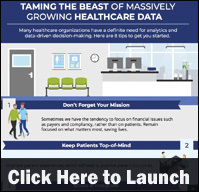 Many healthcare organizations are drowning in the medical and consumer data flood. According to research by IDC Health Insights, hospitals rank analytics as the top driver for new IT spending. The data and analytics pressures prevalent in healthcare make the industry unique, according to a new infographic by Sirius Computer Solutions, Inc. The infographic provides eight tips for healthcare organizations to get started. Healthcare organizations employ a variety of tools and analytics to identify high-risk, high-cost patients for targeted population health interventions. 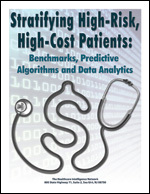 Stratifying High-Risk, High-Cost Patients: Benchmarks, Predictive Algorithms and Data Analytics presents a range of risk stratification practices to determine candidates for health coaching, case management, home visits, remote monitoring and other initiatives designed to engage individuals with chronic illness, improve health outcomes and reduce healthcare spend. » Infographic: Could Amazon's Alexa Become Its New Front Door to Healthcare? This entry was posted on Monday, October 29th, 2018 at 1:30 pm	and is filed under Data Analytics, Healthcare Trends, Infographics. You can follow any responses to this entry through the RSS 2.0 feed. Both comments and pings are currently closed.